Administrative division of Georgia – Georgia is divided into 9 regions, 2 autonomy republics and capital Tbilisi. Regions themselves are divided into municipalities and districts. There are 71 districts in Georgia. Modern division is more or less based on historical province division. Kakheti – consists of historical Kakheti province, Kiziki and Tusheti. Capital of Kakheti is city Telavi. 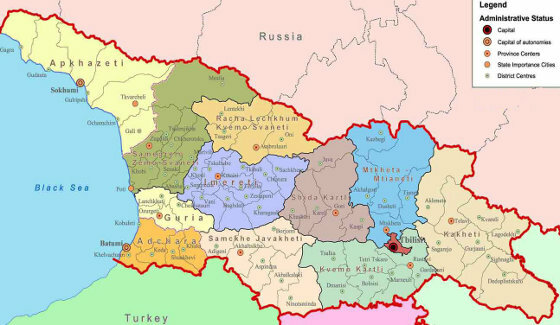 Shida Kartli – Historical Kartli region, north part is occupied by Russians, so called South Osetia. Capital of region is city Gori. Kvemo Kartli – Historical provinces Kartli and Trialeti. Capital city Rustavi. Mtskheta-Mtianeti – consists of Aragvi gorge, Ksani gorge, provinces Gudamakari, Khevi, Mtiuleti and Khevsureti. Ksani gorge is occupied by Russians, so called South Osetia. Capital – Mtskheta. Samtskhe-Javakheti – consists of historical provinces Meskheti, Javakheti and Tori. Capital Akhaltsikhe. Imereti – based on historical province Imereti. Capital city Kutaisi. Racha Lechkhumi Kvemo Svaneti – Consists of historical provinces Racha, Lechkhumi and Kvemo Svaneti. Capital Ambrolauri. Samegrelo – Zemo Svaneti – consists of provinces Samegrelo and upper Svaneti. Capital Zugdidi. Achara autonomous republic – capital Batumi. Abkhazia autonomous republic – occupied, Capital Sokhumi. It is strongly recommended before visiting partly occupied districts to check out where is possible to go without risk. If you travel by your own, ask local authorities where is possible to go and where not. It is NOT recommended to visit fully occupied regions. Visiting those regions from Russian side is prohibited.